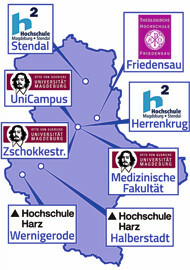 The Canteen with 80 seats is located at basement of building 40 on the extended campus of the university in Zschokkestraße 32. 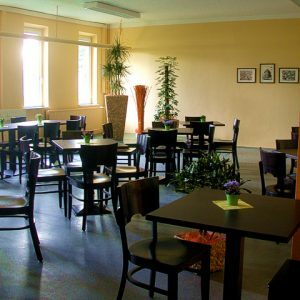 A rich breakfast, a lunch table with three different food and a salad buffet are available in addition to sandwiches, baguettes and hot snacks. The offer is complemented by a variety of coffees. Drinking chocolate and coffee are certified as fair trade and organic. Mon – Thu 8:00 a.m. – 4:30 p.m., Fri 8:00 a.m. – 3:00 p.m.
lunch Mon – Fri 10:45 a.m. – 02:00 p.m.
Mon – Thu 8:00 a.m. – 3 p.m., Fri 8:00 a.m. – 2:00 p.m.